You might ask, “What do dominoes have to do with St Patrick’s Day?” And the answer to that would be “Not much!” They do provide another opportunity to count in a whole different way. In this worksheet kids cut out the numbers. 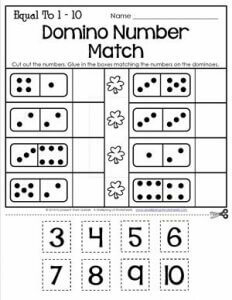 They then count the dots on the dominoes and match and glue the number that is equal to how many dots they counted. Go to this page to see all the St Patrick’s Day worksheets for kindergarten.